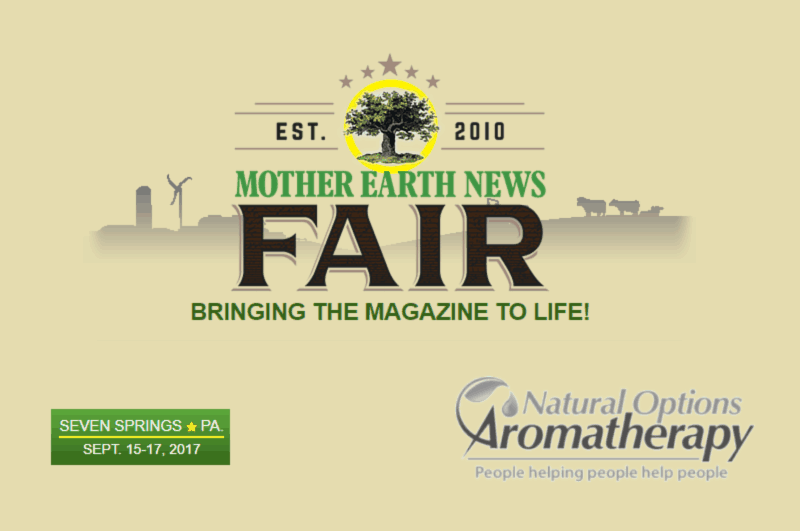 We’re delighted to be attending the Mother Earth News Fair in Seven Springs, PA, this weekend from September 15 to September 17. To celebrate, we’re giving a rundown of the essential oils that every Mother Earth News Fair-goer (and all of our customers in general) needs to try if they want to live a more natural, healthy and planet-friendly lifestyle. We love exhibiting at Mother Earth News Fair and think it’s definitely something all of our customers should attend. At the fair you’ll find over 150 exhibitions and workshops (including us) from leading experts in natural health, organic gardening, homesteading and food preservation. You’ll also find loads of deals on sustainable products, as well as demos on how you can live a more environmentally friendly lifestyle. If you care about the environment, you need to attend this fair. This essential oil is commonly used as a natural bug spray solution. Citronella is especially useful as an insect repellant. You can easily incorporate it into your daily routine by either diffusing it in an oil burner near open windows or putting drops of it in a spray bottle. It will help to keep mosquitoes and other insects away. If you like buying products with citronella already in it rather than making your own, we suggest that you try the Bug Off Roll-On as well as the Bug Off Mist from the Natural Options Aromatherapy website. These products are all natural insect repellant, which not only include citronella but other essential oils like lavender. Cypress is known to be great at absorbing water due to its slightly cooling astringent and diuretic properties. This essential oil is perfect for those people who tend to retain water, sweat easily, and have digestive issues or chronic congestion. You can try Natural Options Aromatherapy products such as the Serenity Body Cream, Organic Serenity Cream, and Serenity Shower Gel to soothe and calm you while making your skin feel healthy. Geranium has an uplifting, sweet and floral aroma, which is perfect for summer months. You can try the Inner Harmony Aromatic Skin Cream, which also contains other essential oils. We also have other products with this oil that help relieve other issues like PMS, hot flashes, and inflammation caused by autoimmune disease available. Eucalyptus is an essential oil that is known to relieve nasal and other respiratory system congestions. It is also known to alleviate pains and muscle tensions, as well as asthma and disorders like Fibromyalgia. This citrus essential oil has that sweet and lovely aroma that is perfect for keeping you bright and cheerful. It has an energizing effect, which is very helpful for those stressful days. Grapefruit oil also helps relieve water retention and metabolize fats as well as soothes a sore throat and topical wounds. To assist you with Seasonal Affective Disorder (SAD), you can try the Liquid Sunshine Blend as well as the Relaxation – Calming and Moisturizing Skin Cream, and Stress Relieving Moisturizing Skin Cream from our website. Lavender is known to be an all-rounder which means it can be useful for all sorts of concerns—from soothing skin irritations like insect bites and sunburn to relaxing your anxious body such as those with fear of traveling aboard a plane. It helps heal physical wounds faster due to its antibacterial properties. This essential oil is also commonly used as an anti-anxiety sleep aid, which relaxes your muscles and alleviates pain. Try our Lavender Moisturizing Skin Cream, Lavender Mist, and the Lavender Patchouli Cream and Lavender Patchouli Roll-On. Lemon is good for keeping you feeling refreshed and stress-free due to its cooling, antiseptic, antidepressant, and antioxidant properties. This is perfect for fighting the summer heat. Also, lemon is known to remove those unwanted odors. Try the Room Spray Lemon Lavender and the Wake-up Blend. Palmarosa is very cooling and contains antibacterial, anti-inflammatory, and cellular-regenerative properties, which are especially helpful for reducing redness. The Satin-Skin Cream available at the Natural Options Aromatherapy website contains other essential oils besides Palmarosa which helps your skin feel satiny soft and smooth. This essential oil is perfect for skin care. You can apply it to mature, dry, cracked, or sweaty skin. Patchouli is also known to elevate that sensual and sexual mood. You can try the combined essential oil found in the Organic Lavender Patchouli and Lavender Patchouli Shower Gel for that relaxing, sensuous, and aromatic feeling.